Morning ladies, so today I want to introduce you to a new brand that has recently launched exclusively at John Lewis called Modern Rarity that is quite simply stunning. 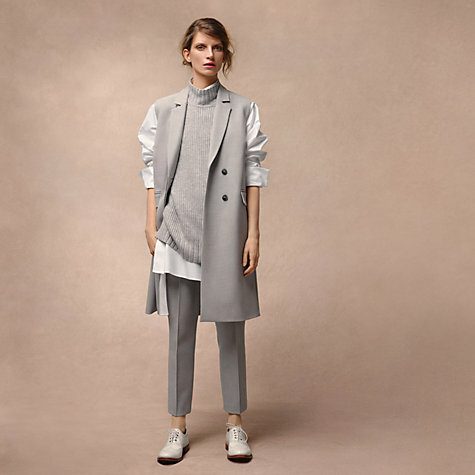 I think the following images from the campaign show perfectly the brands ethos of timeless, premium quality, well designed wardrobe classics that are perfect for building an elegant & chic capsule wardrobe. As I've mentioned in previous posts I don't think you can ever beat the thrill of the high street for those fashion led pieces that help transform wardrobe staples to current trends but as we get older there is a lot to be said for investing in timeless, luxurious pieces that are going to last a lifetime & quite simply look & make you feel amazing. Nothing beats the feeling of wearing a well designed, beautifully cut piece of clothing & if styled correctly can make your whole outfit look a million dollars & of course we all know the virtue of investing in cashmere as the ultimate comfort & cosiness for colder months. So today I thought I would share with you my edit from the collection along with a few style ideas of how I would wear the pieces. I think you will agree that the pieces I've picked would make a great capsule wardrobe & perfect for mixing with each other. I've been lucky enough to have been able to choose a couple of pieces from the collection & the quality of the two items I have chosen are second to none. I've been looking for a grey lace camisole for ages as I wanted to be able to wear it underneath my mohair cardigan so when I spotted the camisole I knew instantly that it would fit perfectly in my wardrobe & after much deliberation for my second piece I decided on the knitted tunic as I think it's perfect for dressing down with denim, layering over a longline shirt not to mention dressing up with leather leggings for a laid back luxurious feel. Naturally I had to have a little trying on session & here's just a couple of ways I'll be wearing the pieces. First off the knitted tunic, which I've layered over skinny cut off jeans & a longline white shirt. The second look is what I'm wearing today. So ladies what are you thoughts? Is it a range you can see yourself being tempted by & if so anything that's standing out for you at the moment? I've only featured a small selection of the brand so would definitely recommend you take a look at the full collection here & I'd love to hear your thoughts. Have a fab day & I'll see you in the morning. Good morning, Jane. Well, I have to say that the I couldn't relate to any of the model pics above, too young and modelly, so the range left me cold. But when I saw your interpretations ... Wow! I can really see those pieces working out in the real world! Well done and thank you. Hi Mary it does make a difference at times doesn't it seeing clothes styled for real life as opposed to promotional images. I'm extremely impressed with the pieces I've been sent the quality & cut is amazing - great timeless pieces definitely worth checking out.